Despite a well regulated municipal water supply and near nationwide access to safe drinking water, Americans spend over $12 billion each year on bottled water. We are greeted with an ever expanding selection of waters for sale—pure water, water with electrolytes, flavored water, water from a spring, water from a glacier, water from a drought ridden state. But few varieties of water make as bold-faced claims of improving health as alkaline water. Available bottled or by do-it-yourself purifier, alkaline water is touted as anything from a fountain of youth to a panacea. First, a brief review course in high school chemistry. The pH, or potential hydrogen, scale runs from zero to fourteen, with 7 as the neutral middle. An acid is a substance with a pH of less than 7. A basic or alkaline substance has a pH of greater than 7. The World Health Organization has no health based guideline for pH in our drinking water. There is no definitive evidence that identifies an optimal pH—in the US, water from the tap or bottle ranges anywhere from 5.2 to 9.5 depending on the state or brand of water. When companies talk about selling you alkaline water, though, they are not just talking about the pH. They are referring to alkalinity—a substance’s ability to buffer acid, preventing rapid changes in pH. Regardless of its pH, for water to have alkalinity requires the presence of mineral compounds—you cannot magically change the alkalinity of pure H2O without adding something to it (magnesium, calcium, bicarbonate, etc.). Among other things, this means that any company selling water that is both “pure” and “alkaline” is misleading its consumers. There are two warring camps in the alkaline water world—those who support at home water ionizers (“artificial”) and those who swear by bottled natural alkalinized water. 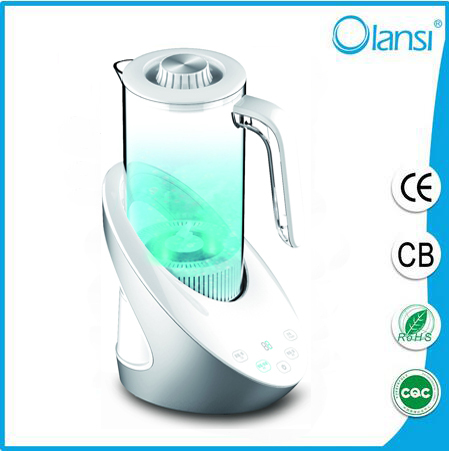 Artificial alkaline water is generally tap water run through an electrical machine. The ionization process splits water molecules and raises the water’s pH. 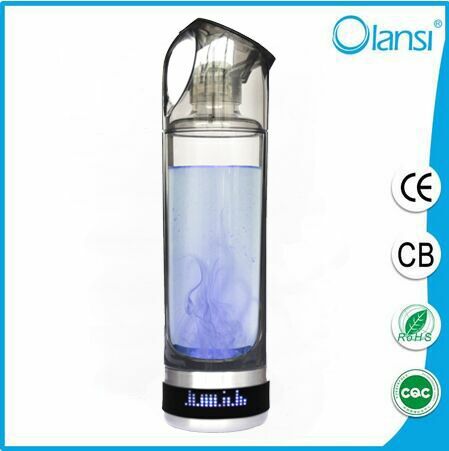 Companies that make naturally alkaline water claim that artificial alkaline water is dangerous. While some studies in rats have shown damaging side effects with consumption of ionized water, there is no such research in humans. In comparison, one hundred percent natural alkaline water is born when water picks up minerals (calcium, magnesium, and others) as it passes through rocks in nature, organically changing its pH and alkalinity. Purveyors claim that only this natural water can offer benefits like reducing the risk of Alzheimer’s and slowing the aging process. Does Alkaline Water Improve One’s Health? That depends on who you ask. If it is someone who has read scientific literature, the answer will be that there is no evidence indicating benefit or harm from drinking alkaline water. If it is someone trying to sell you an expensive ionizer or alkaline bottled water, the answer is yes, absolutely. In theory, alkaline water serves to balance out a condition called acidosis. In a healthy individual, the lungs and kidneys work to maintain a normal body pH. Problems with these organs can lead to either metabolic or respiratory acidosis (or alkalosis). Human blood has a pH of approximately 7.4—slightly alkaline. A fluctuation of as little as .05 in blood pH can have serious health consequences (including death), but the pH of the rest of the body can vary widely. In the stomach, for example, where acids help us to digest food, the pH can go as low as 1.5. Alkaline substances can, in essence, cancel out acidity. That’s the idea behind antacids like TUMS. Treatment for acidosis depends on what’s causing the pH imbalance. Water companies suggest that alkaline water will help to maintain your pH, correct side effects from acidosis, increase your energy, improve your thinking, possibly even reverse aging. The idea that human beings must drink alkaline water for health is partly rooted in the idea that Americans on a high fat modern diet (so, most of them) are in a constant state of acidosis. It is unclear where, exactly, these companies think this alkaline water is affecting us. The stomach is highly acidic and those with excessive stomach acid may benefit from the alkaline properties. But drinking water is not going to flush all of the acid out of your stomach—nor would you want it to (it’s important for things like digestion). Further, and here’s the real kicker, most of the water reabsorption happens in the intestine where your digestive tract secretes enzymes to neutralize stomach contents. So the pH and alkalinity of the water you consume is likely more or less irrelevant. By the time water gets around to affecting your blood, it has already had its pH altered several times by your digestive tract. Despite claims by its proponents that alkaline water will boost metabolism, slow aging, prevent cancer and improve physical appearance for starters, research evidence of support is underwhelming. I had a professor in medical school who used to say that ‘the dumbest nephron (functional unit of the kidney) is smarter than the smartest intern.’ I would rely on the kidney and respiratory system to take care of acid-base balance. In general, if a natural remedy seems too good to be true, it usually is. The spectacular benefits of alkaline water—detoxification, improved mental clarity, hair growth, Alzheimer’s prevention, just to name a few—are not scientifically backed. Purveyors of “natural alkaline water” can preach the hazards of “artificial alkaline water,” but the truth is there is no evidence that their product does any good either. The healthy human body evolved for the careful regulation of our blood pH, no fancy water needed. If you are concerned that your health is being affected by a pH imbalance, please consult a physician rather than relying on magical water cure-alls. That said, we can not discount the placebo effect. Some people may feel healthier drinking tap water after it has been processed through a $4000 machine. Others may swear that drinking alkaline water bottled from Hawaiian springs makes them feel 20 years younger. Still others will be perfectly content filling their reusable water bottles straight from the tap. Regardless of the type of water you consume, the most important thing is that you drink it.